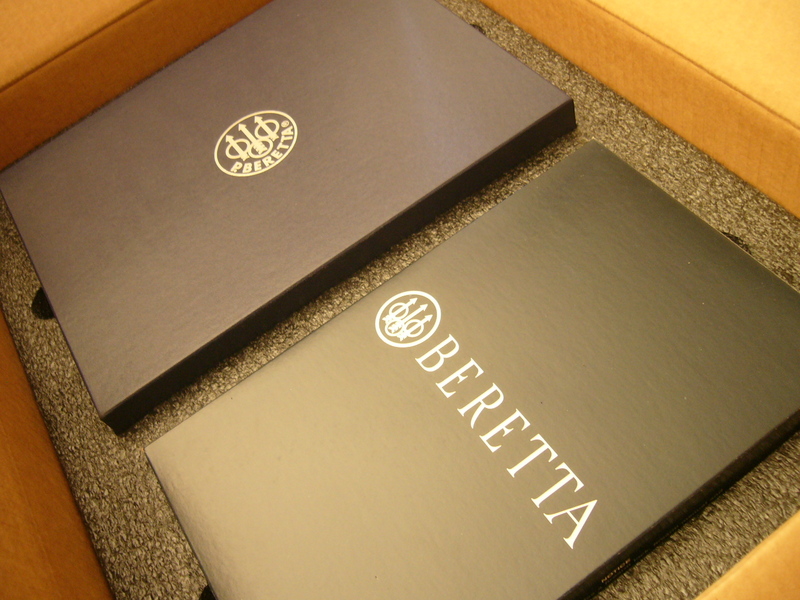 BRAND NEW IN UNOPENED CASES DIRECT FROM BERETTA LIMITED EDITION EXCLUSIVE RUN OF REAL M9 BERETTA’S MANUFACTURED AS PRESENTATION PIECES! 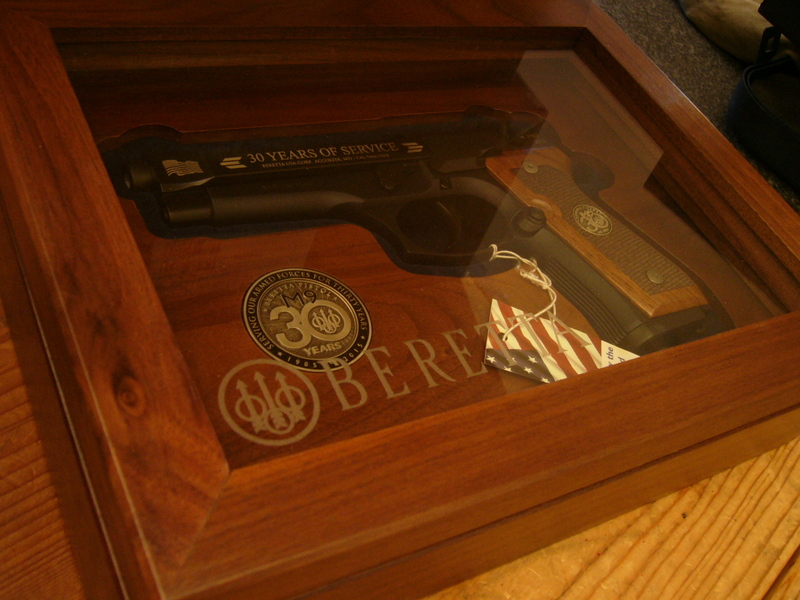 These have some grease on them from the factory and have not been touched by human hands.. yet! 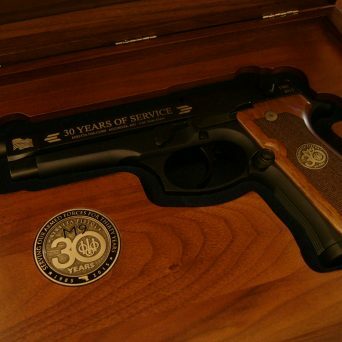 Real M9 pistols manufactured for the U.S. Government, pulled, and hand worked for presentation with upgraded finish, custom markings as shown in pictures, custom wood grips.. “Celebrating 30 years at the side of the US Military these are Beretta custom collector’s edition M9 30th Anniversary Exclusive limited-edition pistols. 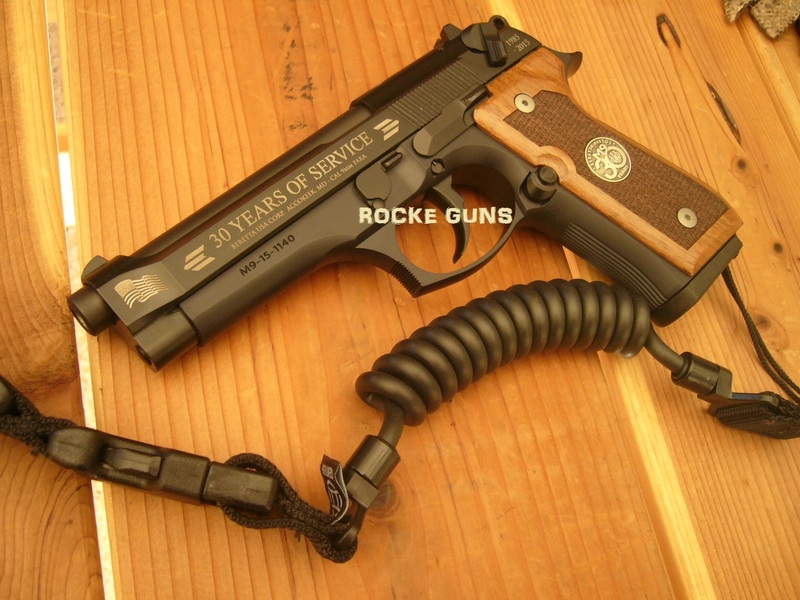 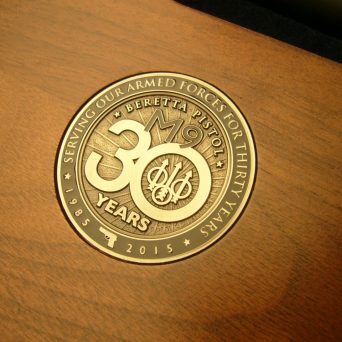 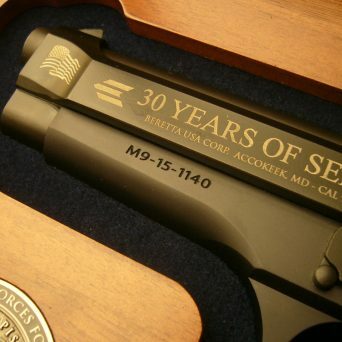 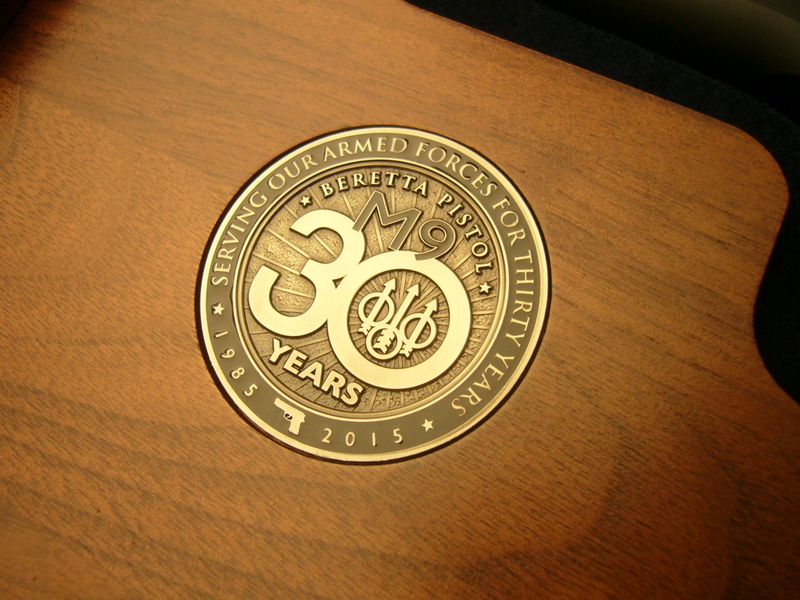 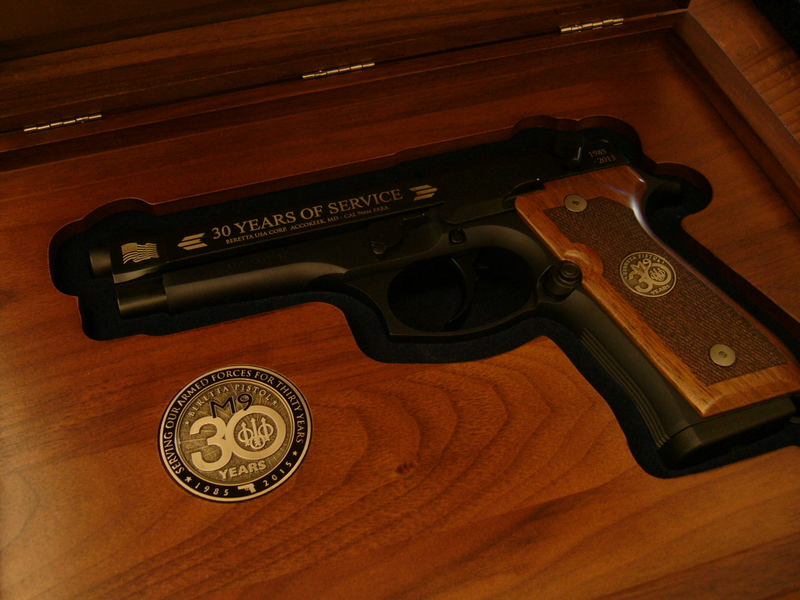 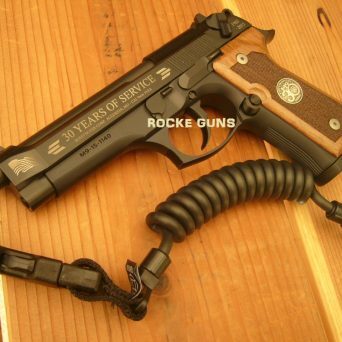 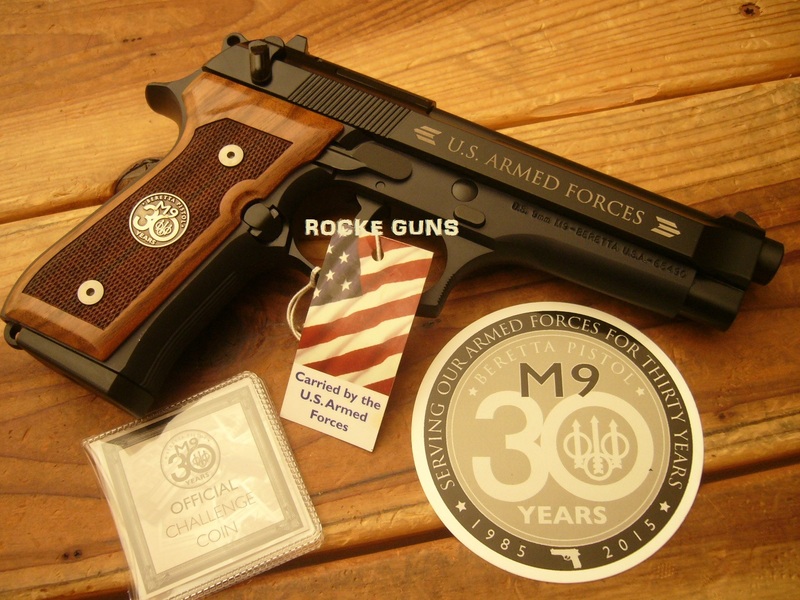 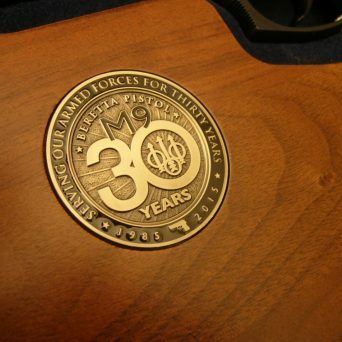 This fully-functional M9 is inscribed in gold inlay on the left side of the slide with the wording “30 Years of Service,” plus the American flag flying at the front. 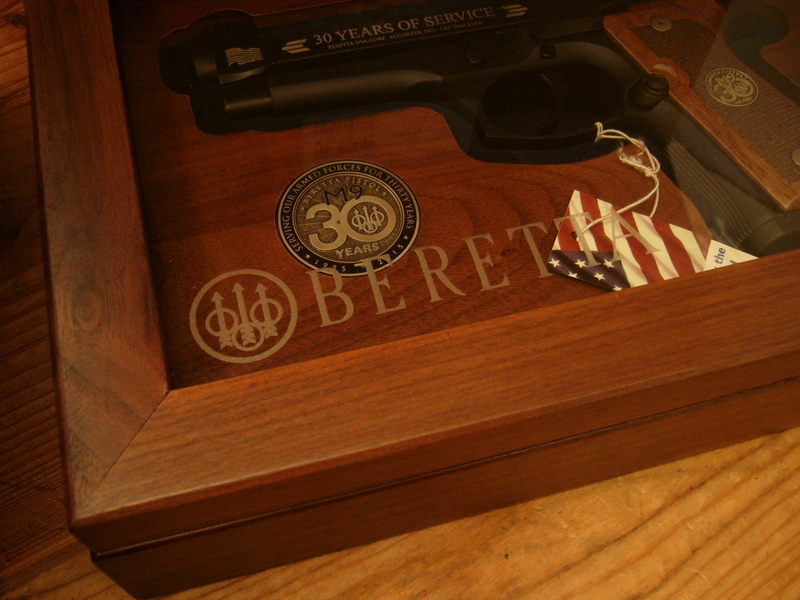 On the right side of the slide, it features “U.S. 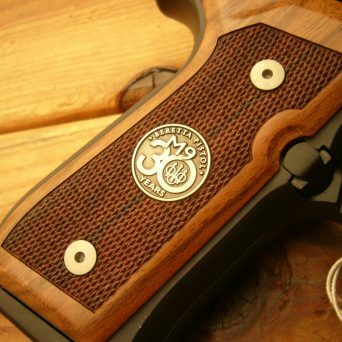 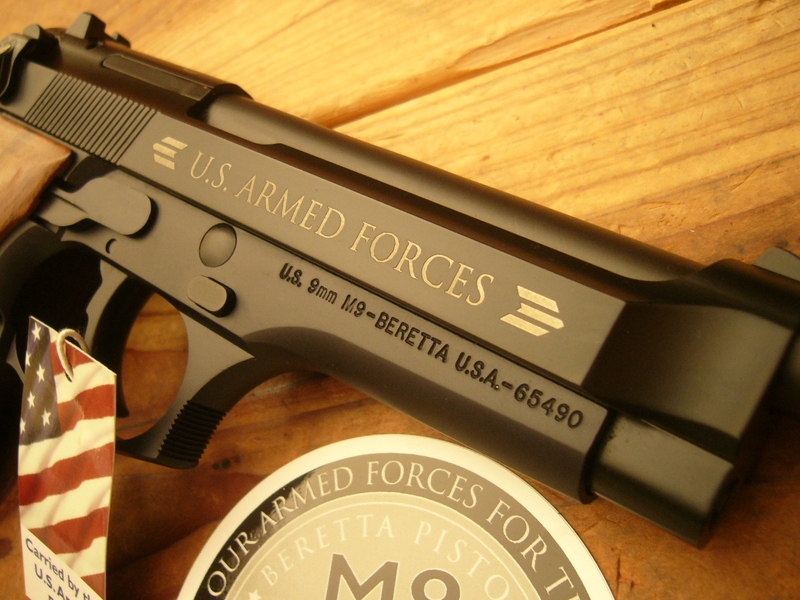 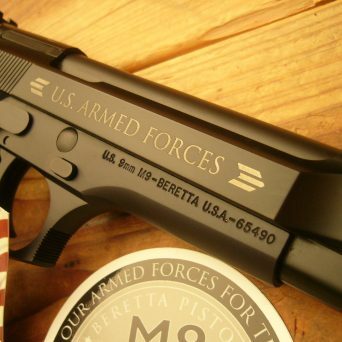 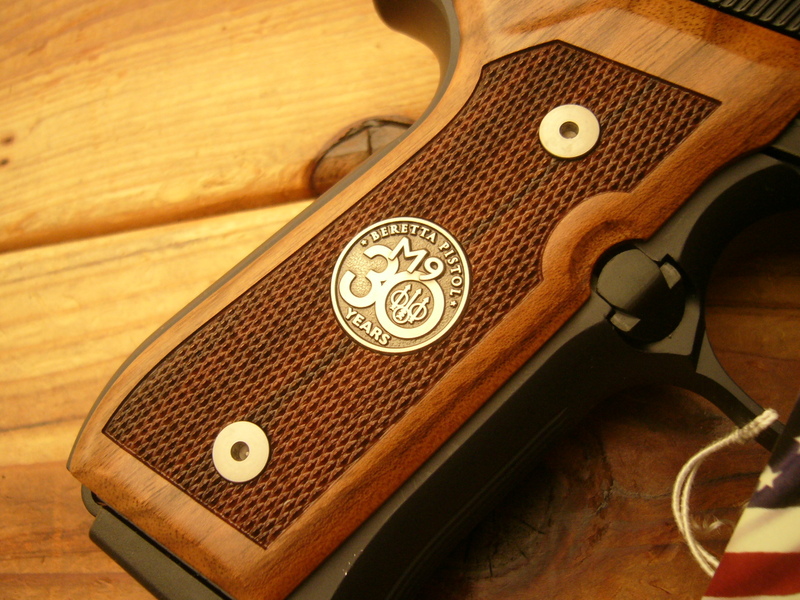 ARMED FORCES”” while just behind the breech face, a Beretta Trident logo is also inscribed in gold inlay. 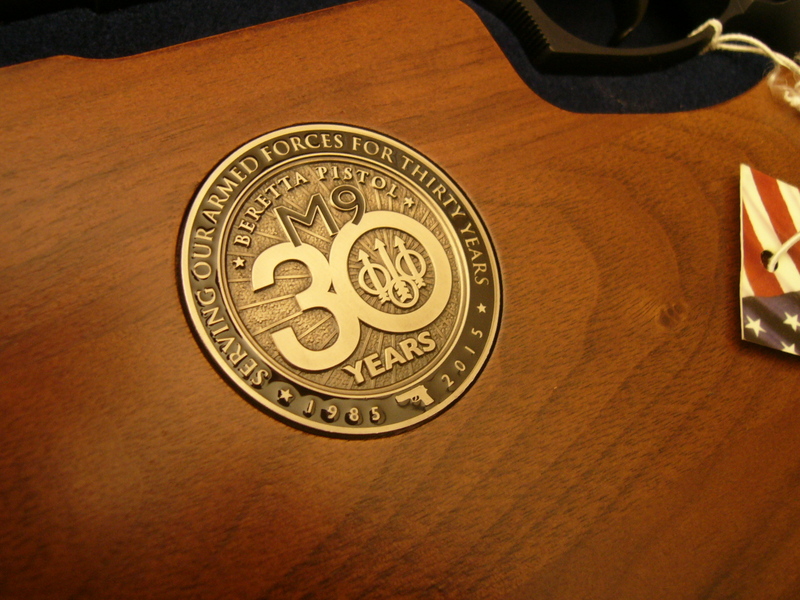 The highly-limited availability of this collector’s pistol includes premium wood grips and inlaid in the grips the 30th Anniversary Exclusive bronze medallion. 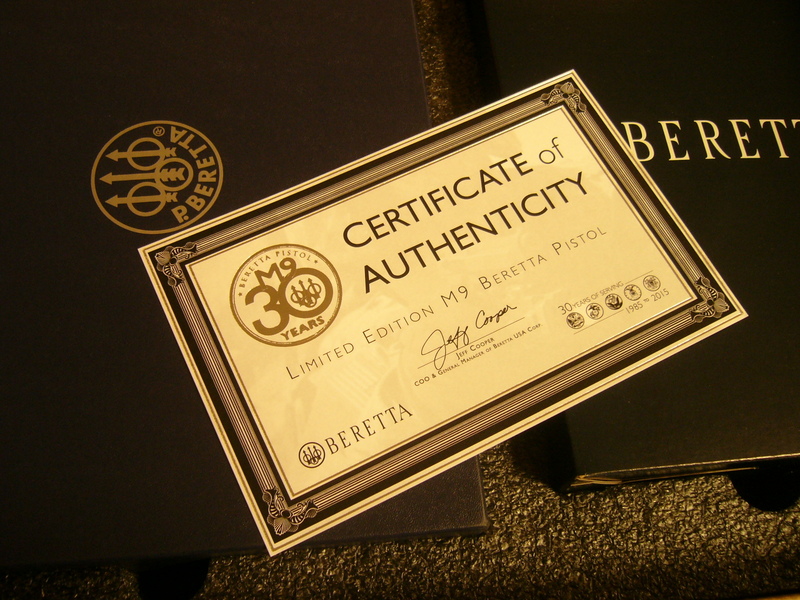 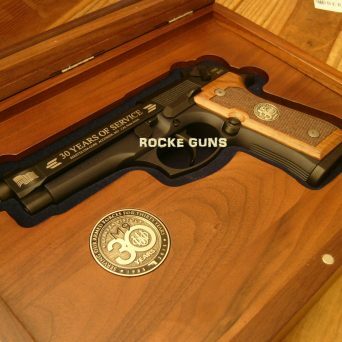 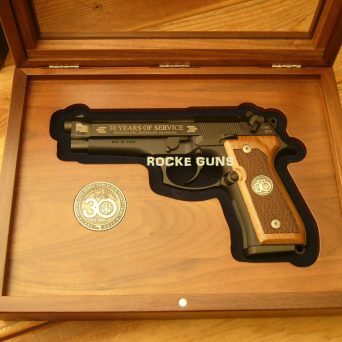 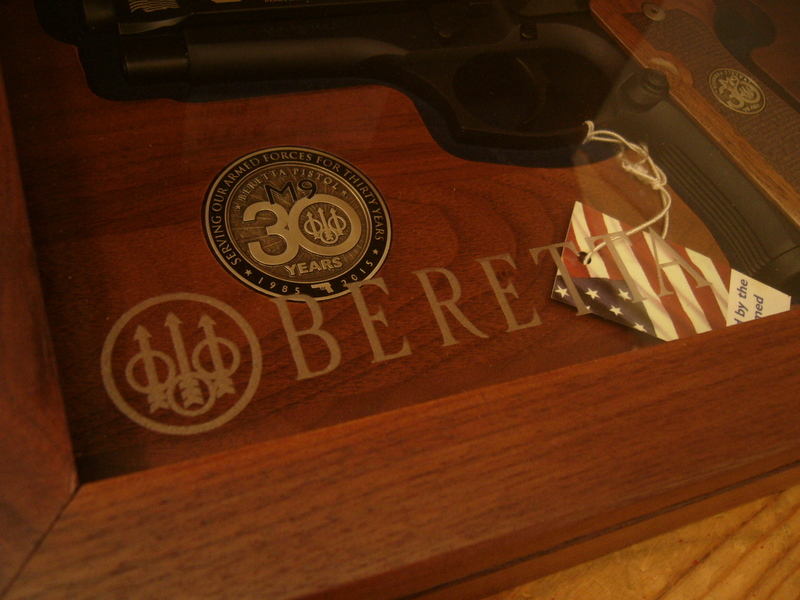 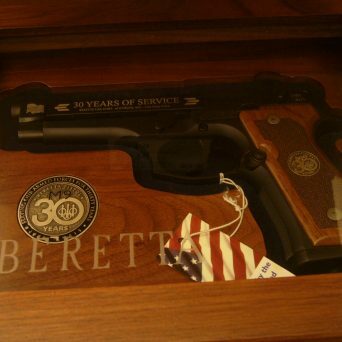 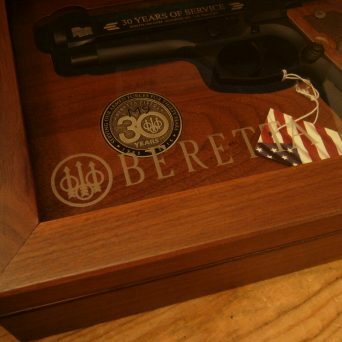 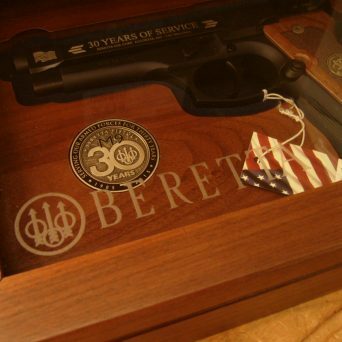 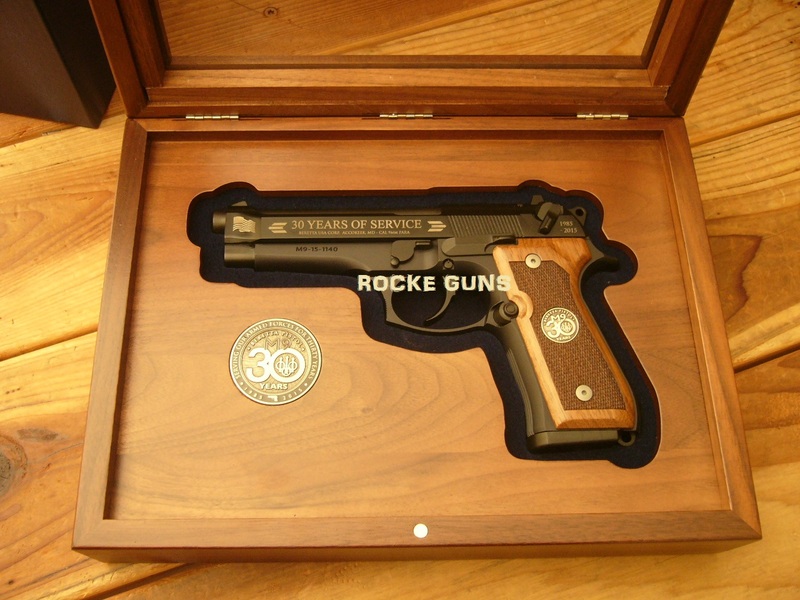 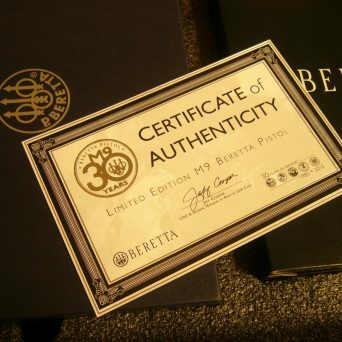 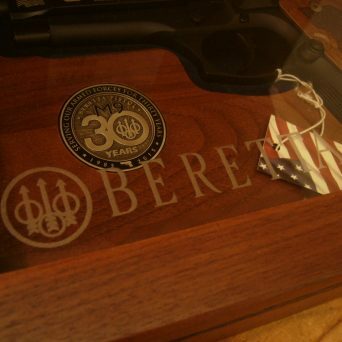 The whole comes with a velvet-lined premium wood box with a Beretta-logo plaque, a limited-edition challenge coin and a certificate of authenticity featuring the pistol’s serial number. 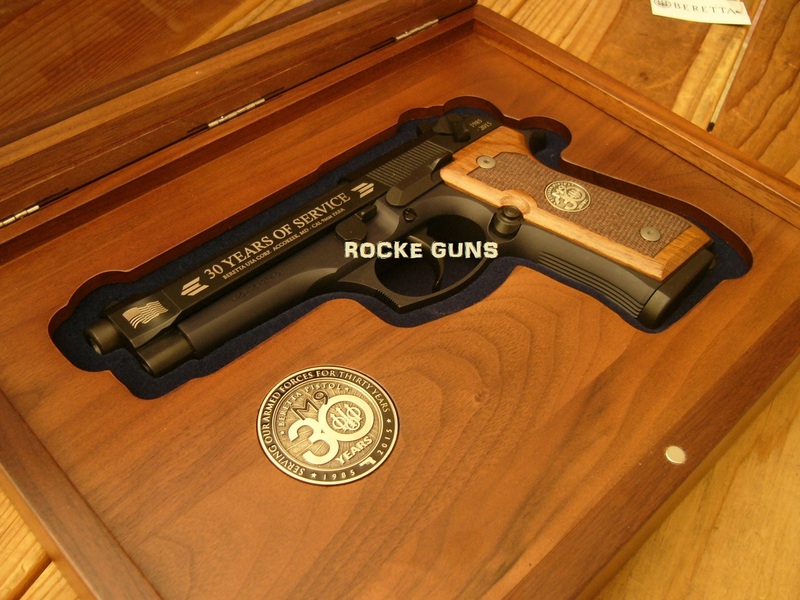 In all, this pistol offers an opportunity to own a piece of history as well as a highly-collectible, one-of-a-kind model. 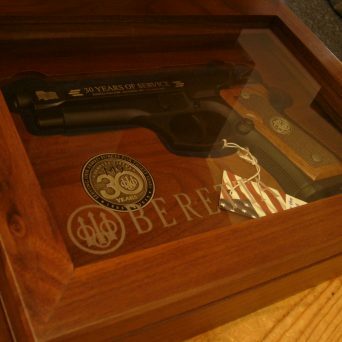 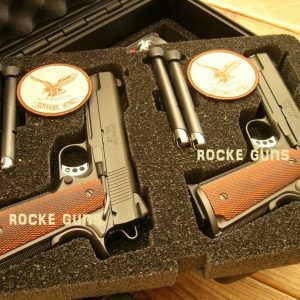 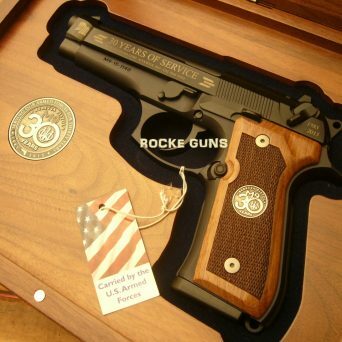 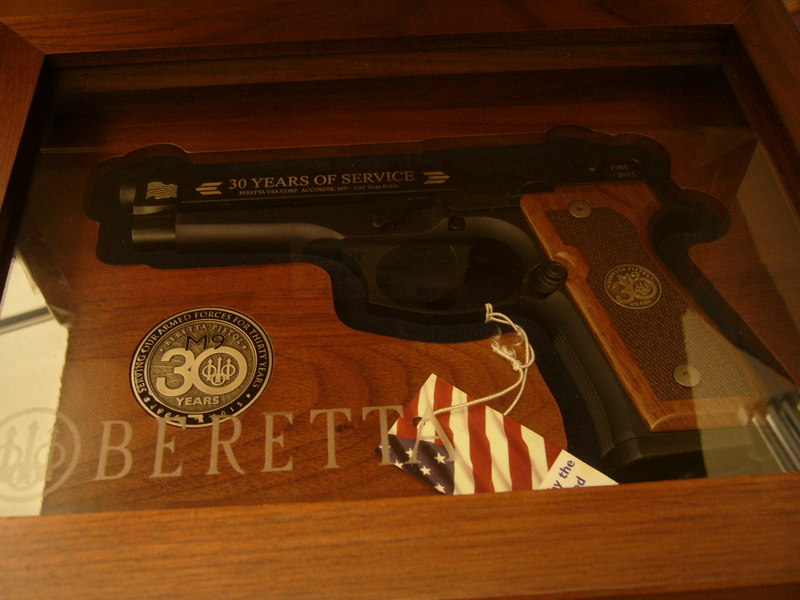 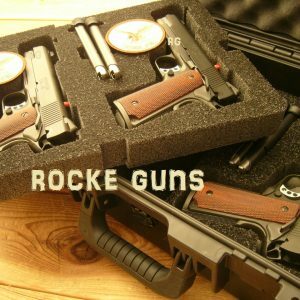 In addition these pistols are stamped as issued to the United States Military with “U.S. 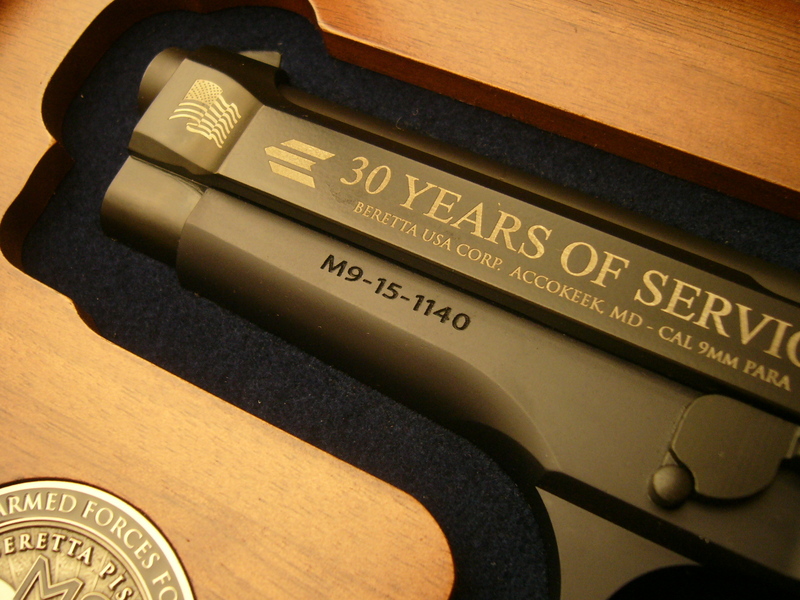 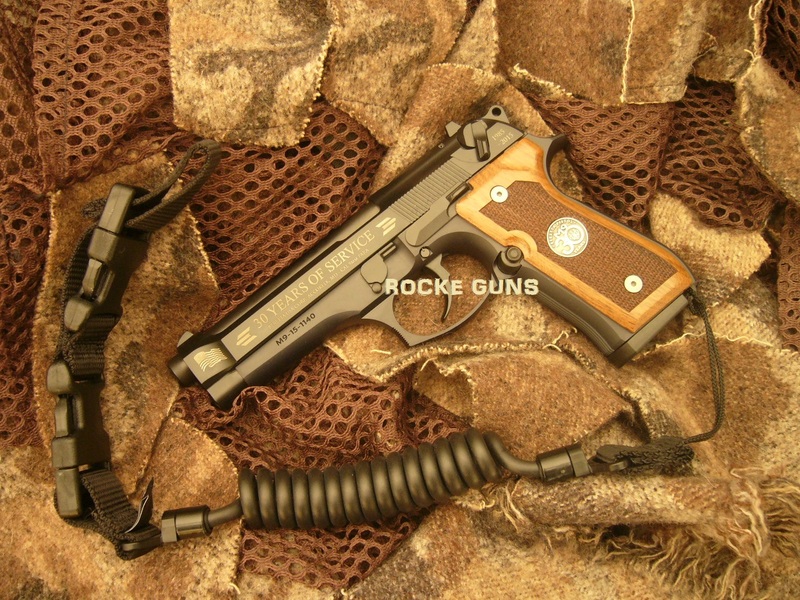 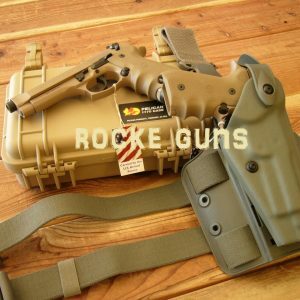 9mm M9” starboard side and “M9″ with serial number port side. 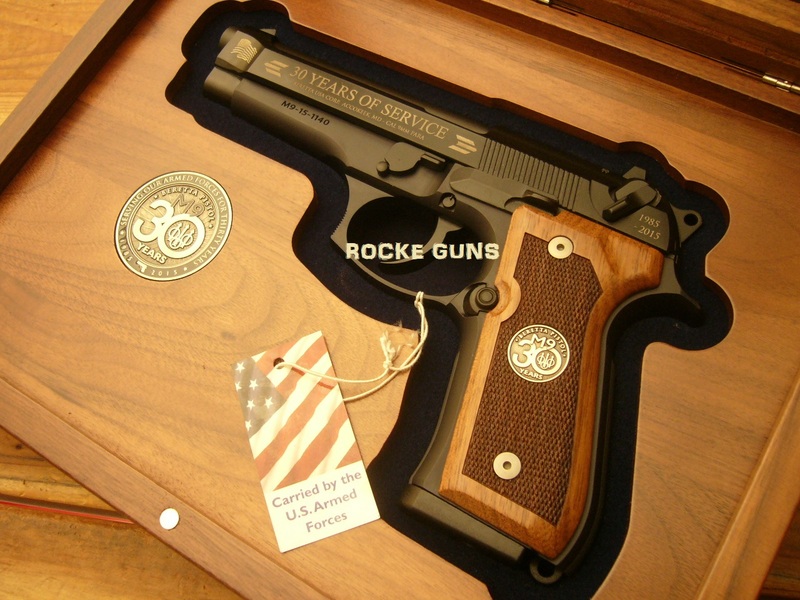 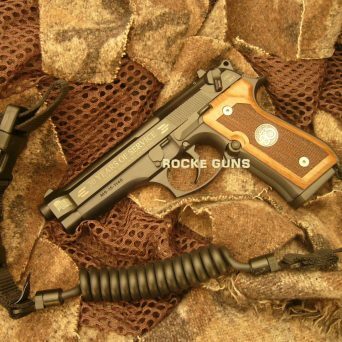 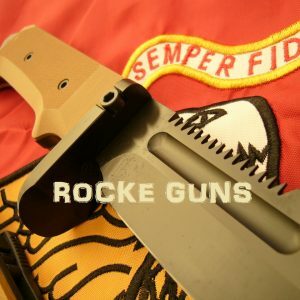 As per government testing guidelines, this pistol is capable of firing 10-shot groups of 3 inches or less at a distance of 50 meters (approximately 55 yards), with consistency and reliability. 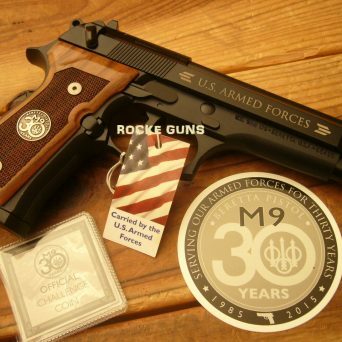 With other brands and models of premium pistols, this kind of accuracy may only be attained with extensive (and expensive) modifications and customization with after-market parts, while these presentation M9 pistols accomplish this with ease right out of the box”. 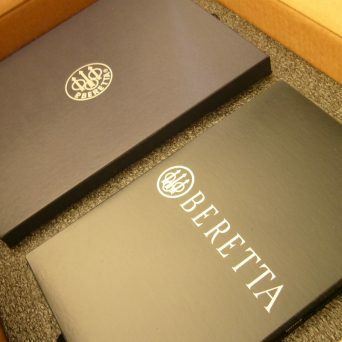 There are a few of these out there but none are brand new never handled never touched direct from Beretta as these are. 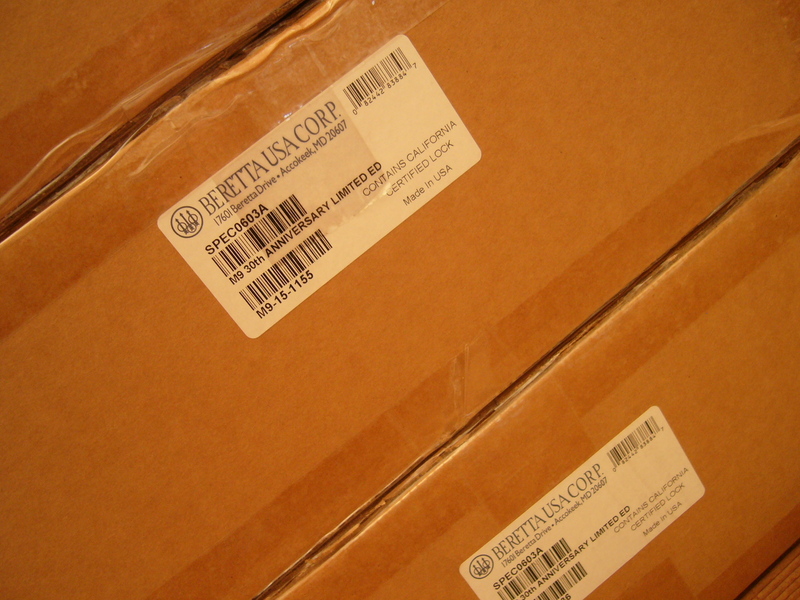 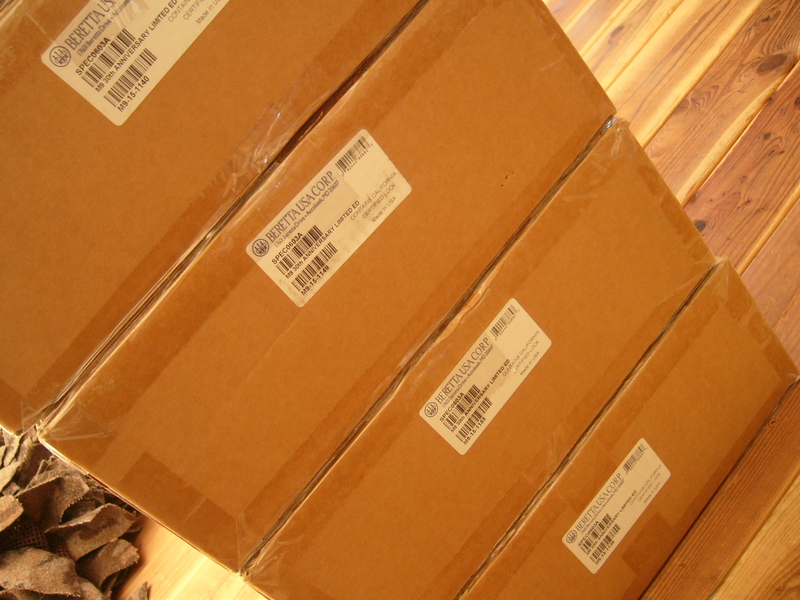 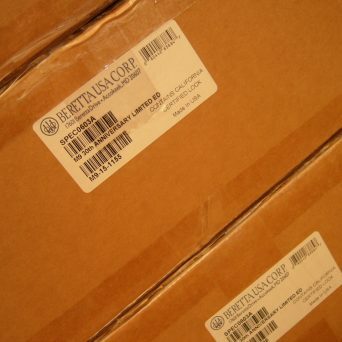 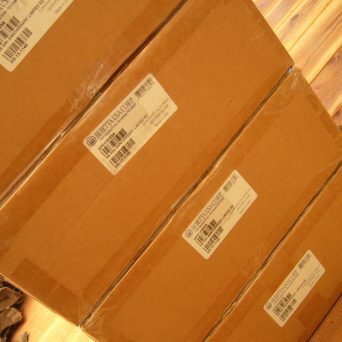 Units are packed in a large cardboard box; upon opening are two more presentation boxes. 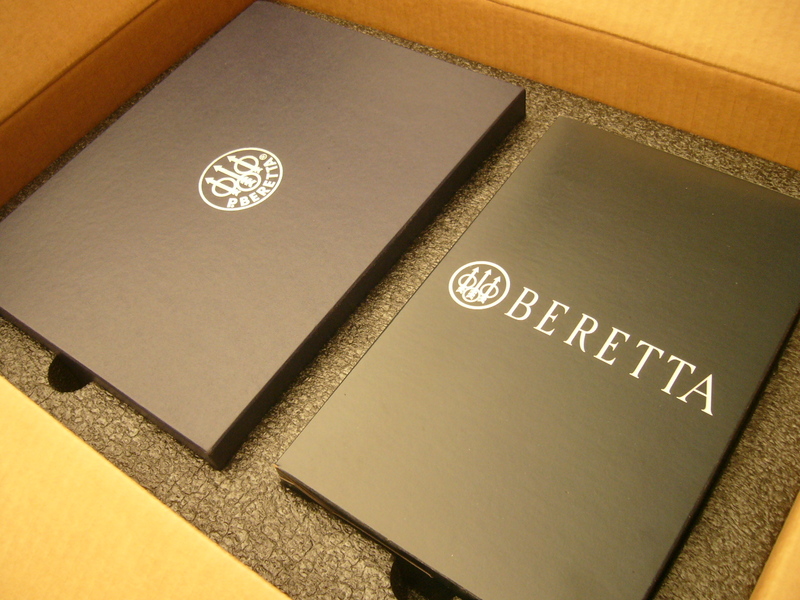 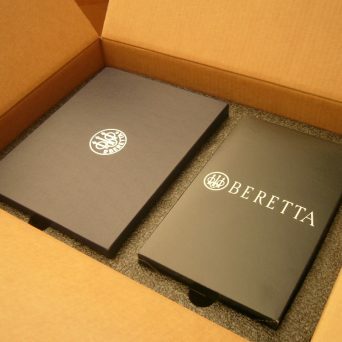 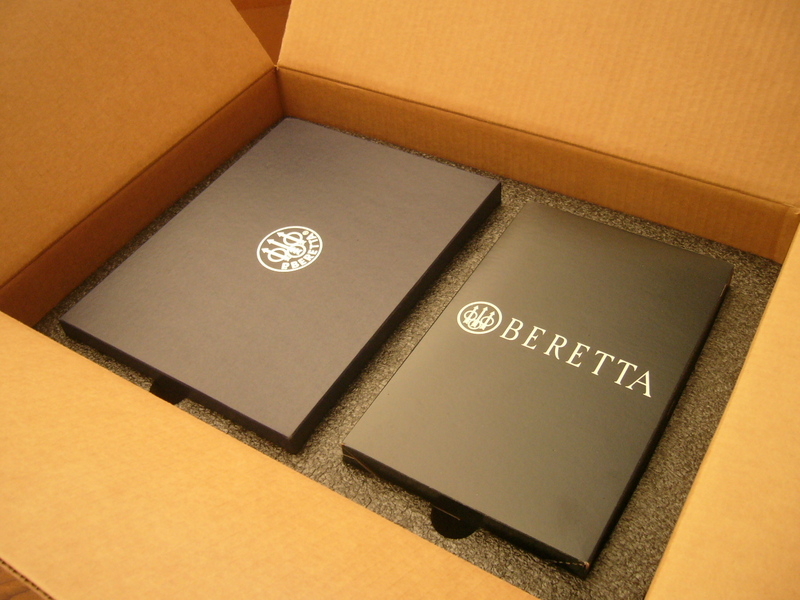 One contains the pistol in the blue Beretta hard case and the other contains the Beretta Presentation Premium Wood case. 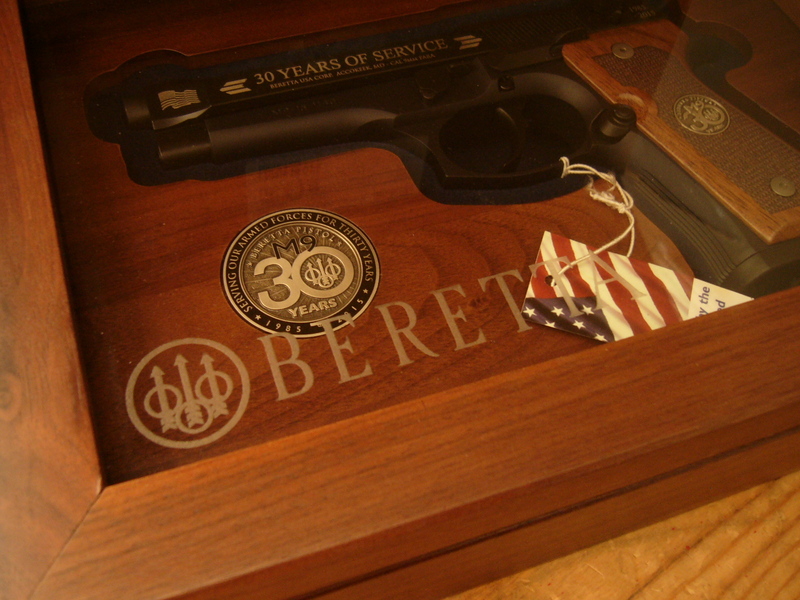 Also included are owners manuals, challenge coin, challenge coin holder, U.S. issue tag, military issue lanyard. 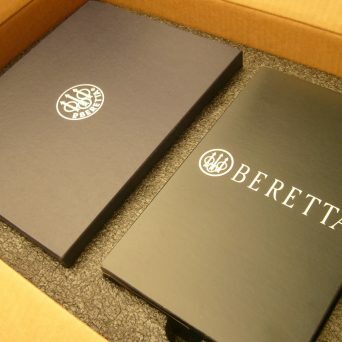 Please note we will pull the Beretta pistol and ship to your FFL (local gun store) in the Beretta blue hard case and everything else will ship to your home or business or wherever; we do not want your local gun store employees playing with, and marring, the limited edition accoutrements included with this phenom.